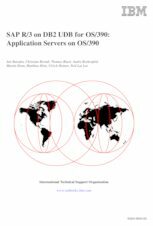 This IBM Redbooks publication describes the installation and operation of SAP R/3 4.6B with application servers on OS/390 using DB2 UDB for OS/390 as the SAP R/3 database server. The book is one of a series that focus on SAP R/3 when DB2 UDB for OS/390 is used as a database server. A large portion of the book is devoted to installation of the SAP product when application servers are to be on OS/390; how to use CDs from another platform to install, how to configure the software, and how to migrate from an SAP R/3 system that is using the 4.5B release. 1. As an SAP R/3 central instance: We concentrate on how the central instance is placed on OS/390 and how to achieve operations, availability, and performance benefits in that configuration. 2. Executing SAP R/3 batch and update processes: We mainly concentrate on configuring batch application servers on OS/390. We also examine how OS/390 can provide asynchronous update processing and allow SAP R/3 installations to obtain general OS/390 benefits, as well as the benefits of being on the same processor as the database server. 3. Performing SAP R/3 printing functions on OS/390. We examine how to take advantage of OS/390 printing and spooling capabilities from SAP R/3.